Reading and discussion. 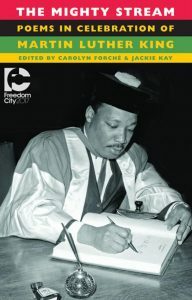 As part of a fifty year anniversary and celebration, this anthology gathers poets from both sides of the Atlantic to address the challenges set out by Dr King. It’s a shock to think how little has changed, and that Martin Luther King could well be speaking right here, right now. In the spirit of Dr King and his work as a humanitarian and activist, this event presents poems that offer powerful testimonies to the urgent issues Dr King defines and represents the polyphony of voices that speak in resistance to our continuing problems of racism, poverty and war. With co-editor Jackie Kay, Major Jackson and Zaffar Kunial.